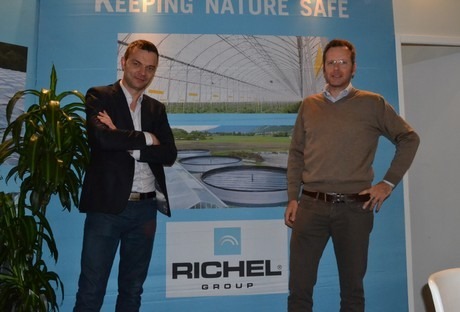 Arnaud Franceschini, regional director of exports at Richel and Matthieu Lerch, Richel’s Sales Manager for Italy during MacFrut Cesena 2014, which was held last week. “However, this summer the weather was unfavourable for open field lettuce growers, and as a result many are thinking about introducing low-tech plastic greenhouses to protect their crops against frost and hail,” explains Arnaud. Richel’s greenhouses are renowned for their strength, durability and good balance between quality and price. “Regardless of vegetable prices, our business keeps growing because of a professionalization of the sector, which means that growers are spending more on equipment, as they don’t want to risk the effects of snow, wind or hail,” affirms Arnaud.